Perry Block - Nouveau Old, Formerly Cute: Jewnado! The Sequel. Too much said. As the film begins, the voice of a TV weathercaster is heard as we see multiple waterspouts whirling and swirling in the skies over Los Angeles. Weather caster: For the second time in recent weeks a freak storm has struck LA bringing torrents of rainfall, the formation of tornado like waterspouts bearing menacing creatures swept up within them, and multiple break-in special reports by hot weather babes like myself. More reports later after I put on a tighter blouse! Our standard issue protagonists are seen standing in a devastated downtown LA. They have names like April, Fin, Nova, Baz, Matt, and Claudia. Want to know more about them? No offense, but I think you need a life! Fin: I never would have believed it! Weeks ago we survived Sharknado and became a surprise ratings hit. Now it's happening all over again! Baz: How did they whip together a sequel this fast? Fin: Don't knock it. Most of us wouldn't have careers except for this! Nova: A huge waterspout is approaching! Matt: Something's in it! A creature! A menacing creature!! April: It must be a killer shark! It's Sharknado all over again! Claudia: It’s upon us, there’s no escape!!! Menacing Creature: Hi, I’m Carlos Danger. Want to see a picture of my crotch? Fin: Why, this isn’t Sharknado! What kind of storm is this?! Anthony Weiner: Hey, you hot young standard issue women! Want to talk dirty with the next mayor of New York? April: But, Mr. Weiner, I thought you said this behavior was behind you! Anthony Weiner: What I meant was the behavior involves my front and my behind! Or my tuchas, as our people call it. Nova: Is there no way to stop it? Fin: Whatever you do, girls, don’t tweet back! Just don't tweet back! Weathercaster: We interrupt this broadcast with a further update now that I have tighter clothing on! More waterspouts have been sighted throughout LA and swirling within them are Congressman Eric Cantor, actor Adam Sandler, and ... God forbid it lands near you... comedian Bob Saget! Matt: Why this isn't Sharknado at all! Claudia: If this is Jewnado, why couldn't the waterspouts have sucked up Jon Stewart, Joseph Gordon-Levitt, or Robert Downey Jr? After all, he's a JewBu! Baz: Or Mila Kunis, Gwyneth Paltrow, or Natalie Portman? They can swirl around at 90 miles per hour with me anytime! Fin: Because Jewnado is a freak force of nature, without Jewish compassion, liberal ideals, or sense of social justice! And no finely tuned but slightly irreverent sense of humor either! Here comes another waterspout! April: Is there a menacing creature aboard?! Nova: Is it talk show host Larry King?! Matt: Or the late sportscaster Howard Cosell?!! Nova: Or ... God forbid it lands near us ... comedian Bob Saget?!!! Fin: No, look! It's venerable character actor Abe Vigoda! Why, he could never harm we standard issue characters! Matt: The storm must be subsiding! Fin: It is subsiding! Here comes another waterspout; look, it's venerable character actor Fyvush Finkel! Ha, the worst is indeed over! Weathercaster: (talking directly to the standard issue cast) I wouldn't be so sure about that. Weathercaster: The producers are talking another sequel, and it will be even worse! 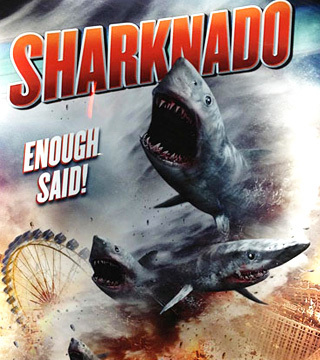 April: What could be worse than Sharknado or Jewnado? Weathercaster: I kind of hate to tell you. It may lower my ratings and make me less hot. April: Tell us! Please, we must know! ROFL, Perry, I'm dying over here. (No exclamation points, though, because you've used them all up). I believe after Kardashianado comes Bieber/Bynes/Lohanado and then we're done. Either than or Western civilization is. Hahahahahahahaha <------ All that needs to be said, really. Thank you, Ms. Z! Surprisingly though Sharknado is fading fast. Of course that's good to say.